Hi crafters! Monica here sharing my first card using a die from the August release "witch" is centered around Halloween. 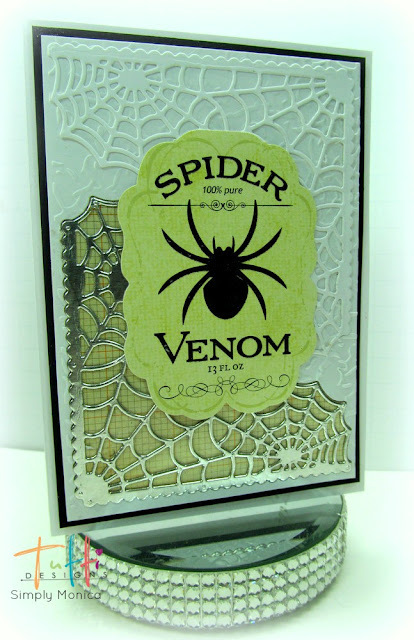 My card for today I am using the Spiderweb Corner die TUTTI-381 to create a fun window card. To create a look of metal I used some air conditioning tape from Lowe's and laid it against some cardstock so it was nice and sturdy. Run your die through your machine as usual. Once complete I then die cut another web so I could use the outline for the window. Once done I laid a piece of acetate on the back of my card front and placed my metal web inside the outline. You can use a nice piece of patterned paper underneath to bring out the diecut. I also, diecut another web in white for a fun background. I hope everyone enjoyed my post and thanks so much for stopping by. Be sure to check out all the Tutti links for more inspiration! Love your double spiderweb creation Monica! Thanks for tips & tricks and how to's on making this fun design! Great inspiration! Fab Halloween card, Monica! I love this corner spider web die cut.